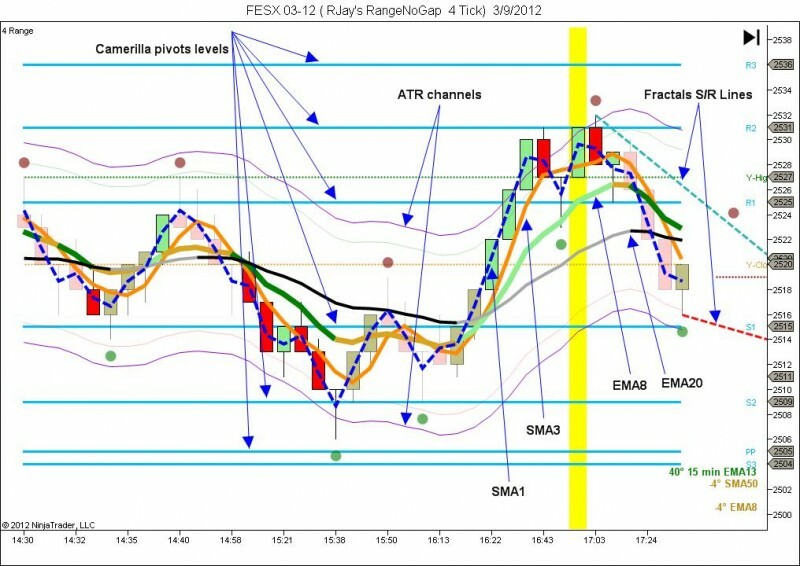 Scalping is a form of very short term trading that skims small profits at a high frequency, when we trade FESX by his nature, it not allow to enter many times, its more quiet with clean moves and i think perfect to start testing our strategy, if somedays i dont see any good opportunity with FESX I will try to trade 6E that move faster. Range bars: it just look price, the bar does not close at a specific time but closes when a range is complete. We will trade FESX (EURO STOXX 50 Index Futures) Futures and 6E (EuroUSD) Futures, but this system can be applied to any 6A, 6C, 6S, GC, SI, CL, TF, etc. with the appropiate timeframe depending of the volatility of the instrument. Camerilla pivots, its a range of Support and Resistance levels where prices was moving last day. The High time frame of Range 15 condition to avoid more distraction its included already and condition is satisfied when bar turn color to red or green chaging contrast. The contract is traded on the Eurex. The value of the Eurostoxx futures is 2.494 x 10 € = 24.940 €. Buy 3 contracts at 2.494 and sell at 2.500. The minimum price movement of ‘tick’ is 1 point. When the Eurostoxx index goes from 2.494 to 2500 or 6 point, a profit of 6 points x 10 x 3 contracts = 180 € is realized. The contract is traded on CME futures market. Buy at 1,3113 and sell at 1,4513. The minimum price movement of ‘tick’ is 0,0001 point. Hi! Are you selling your mjosescalper NT automated strategy? I am interested in trying it out.